Leonard Freed was a documentary photojournalist and longtime Magnum member. He was born to Jewish, working-class parents of Eastern European descent. Freed had wanted to be a painter, but began taking photographs in the Netherlands and discovered a new passion. He traveled in Europe and Africa before returning to the United States where he attended the New School and studied with Alexey Brodovitch, the art director of Harper's Bazaar. In 1958 he moved to Amsterdam to photograph its Jewish community. Through the 1960s he continued to work as a freelance photojournalist, traveling widely. He documented such events and subjects as the Civil Rights movement in America (1964–65), the Yom Kippur War in 1973, and the New York City police department (1972–79). His career blossomed during the American civil rights movement, when he traveled the country with Martin Luther King, Jr. in his celebrated march across the US from Alabama to Washington. This journey gave him the opportunity to produce his 1968 book, Black in White America, which brought considerable attention. His work on New York City law enforcement also led to a book, Police Work which was published in 1980. Early in Freed's career, Edward Steichen purchased three photographs from Freed for the collection of the Museum of Modern Art. [ In 1967, Cornell Capa selected Freed as one of five photographers to participate in his "Concerned Photography" exhibition. Freed joined Magnum Photos in 1972. Publications to which Freed contributed over the years included Der Spiegel, Die Zeit, Fortune, Libération, Life, Look, Paris-Match, Stern, and The Sunday Times Magazine of London. In later years, Freed continued shooting photographs in Italy, Turkey, Germany, Lebanon and the U.S. He also shot four films for Japanese, Dutch and Belgian television. Born in Brooklyn, New York, to working-class Jewish parents of Eastern European descent, Leonard Freed first wanted to become a painter. However, he began taking photographs while in the Netherlands in 1953, and discovered that this was where his passion lay. In 1954, after trips through Europe and North Africa, he returned to the United States and studied in Alexei Brodovitch's 'design laboratory'. He moved to Amsterdam in 1958 and photographed the Jewish community there. He pursued this concern in numerous books and films, examining German society and his own Jewish roots; his book on the Jews in Germany was published in 1961, and Made in Germany, about post-war Germany, appeared in 1965. Working as a freelance photographer from 1961 onwards, Freed began to travel widely, photographing blacks in America (1964-65), events in Israel (1967-68), the Yom Kippur War in 1973, and the New York City police department (1972-79). He also shot four films for Japanese, Dutch and Belgian television. Freed joined Magnum in 1972. His coverage of the American civil rights movement first made him famous, but he also produced major essays on Poland, Asian immigration in England, North Sea oil development, and Spain after Franco. Photography became Freed's means of exploring societal violence and racial discrimination. Leonard Freed died in Garrison, New York, on 30 November 2006. This Is the Day: The March on Washington is a stirring photo-essay by photographer Leonard Freed documenting the March on Washington for Jobs and Freedom of August 28, 1963, the historic day on which Dr. Martin Luther King Jr. delivered his “I Have a Dream” speech at the base of the Lincoln Memorial. This book commemorates the fiftieth anniversary of the historic march that ultimately led to the passage of the Civil Rights Act of 1964. 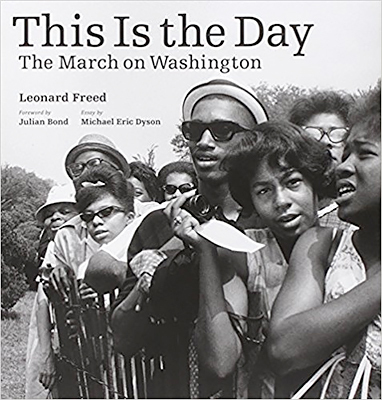 Never before published in book form, the seventy-five photographs in this volume were chosen from among the hundreds of images that Freed made in the nation’s capitol—before, during, and after the march. These images not only present us with stunning wide-angle views of hundreds of thousands of marchers overflowing the National Mall but also focus on small groups of people straining to see the speakers and on individual faces, each one filled with hope and yearning, epitomized by the beautiful young woman who throws her entire being into singing "We Shall Overcome.” In addition are eighteen pictures from the twentieth-anniversary march of August 1983, conveying a sense of celebration coupled with peaceful protest. Accompanying the photographs are a first-hand, backstage account of the preparations leading up to the march by social activist and civil rights leader Julian Bond; an essay on the importance of the march and Dr. King's involvement by sociology professor and author Michael Eric Dyson; and an informative discussion of Freed’s approach to the photographic project by scholar Paul Farber. The American photographer Leonard Freed travelled to Germany for the first time in 1954. He observed the people in their social surroundings, at work, at street festivals, in public parks, in the streets and against the industrial backdrop of the Ruhr Valley. The Germany he saw was deeply scarred by the effects of war and the Nazi regime, despite the country's reconstruction, industrial development and economic success. 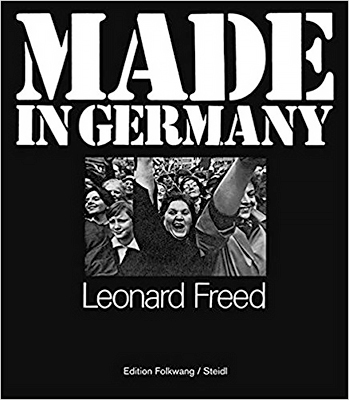 Freed published his extensive report Made in Germany for the first time with Grossman Publishers in New York in 1970. The present reprint accompanies the exhibition of the same name at Museum Folkwang in Essen and comes with the booklet Re-Made: Reading Leonard Freed, providing extra information about Freed's approach and his times. The booklet is edited by Paul M. Farber and contains hitherto unpublished images, documents and writing by Freed, spanning his 50 years of photographing Germany. Leonard Freed (1929-2006) was inspired to capture the African American experience while he was in Berlin in 1962 to photograph the building of the Berlin wall. He noticed a black soldier standing in front of the wall and was struck by the fact that this soldier was ready to defend America abroad, while at home African Americans were facing their own battle for civil rights. Traveling in New York, Washington, D.C., and throughout the South, Freed captured images that reflected the struggle for the end of racial segregation. 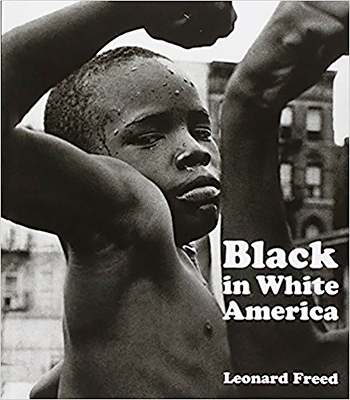 First published in 1968, Black in White America shows many aspects of black life in 1960s America, from political marches and rallies to children playing and splashing in the spray of a fire hydrant, from signs for colored entrances to interactions with whites. One particularly poignant image shows Martin Luther King Jr. in an open convertible being greeted by an eager crowd of admirers. Freed's captions include observations, stories about the people he met, lyrics from spirituals, and an excerpt from the "I have a dream" speech. Mary Ellen Mark is an American photographer known for her photojournalism, portraiture, and advertising photography. She has had 16 collections of her work published and has been exhibited at galleries and museums worldwide. She has received numerous accolades, including three Robert F. Kennedy Journalism Awards and three fellowships from the National Endowment for the Arts.